Have you ever heard someone lament that it’s impossible to outrun your fork? Well, most weight loss experts agree: diet ultimately proves more important than exercise in achieving your weight loss goals. Even so, most of us struggle to limit our intake to only the limited number of calories needed to maintain (or lose) weight. Whether it’s because of constant marketing from the food industry, a drive to emotionally eat, or a simple disconnection with hunger cues – evidence shows overeating is a growing concern. More than one third of American adults are classified as obese, and double that number are considered overweight. This statistic is only expected to grow in coming years. It makes sense, then, that interest in prescription appetite suppressants is also increasing. Here we’ll talk a little about prescription appetite suppressants, who’s eligible to take them and different varieties available to you as a consumer. Prescription appetite suppressants are medications that a doctor can prescribe to help you eat less. Most of these pills work as central nervous system (CNS) stimulants. In other words, they trick your body into initiating a response similar to “fight or flight”. As part of this reaction, your appetite is suppressed and energy is increased. With the boost of adrenaline, thoughts of food no longer dominate your day and, when you do eat, hunger is less pressing. The chemical change also gives you energy to move more and get in your recommended daily activity. So, these medications work from the inside out to help you eat less and become more active. The combination results in almost-guaranteed weight loss. Still, prescription appetite suppressants keep your body in a near-constant state of simulated stress. As a result, they’re only indicated for short-term use. The suggested prescribing period is for three months or less, although your doctor may consider additional rounds of medication after a break, if necessary. Prescription appetite suppressants are an effective and popular way to kickstart major weight loss, but it’s important for you to put in the work as well. Reforming your eating habits and establishing a consistent workout routine are critical to reaching your goals and maintaining weight loss long-term. Prescription weight loss drugs, like phentermine, are intended for patients with exogenous obesity and a BMI over 30. Some medications are also available for individuals with a BMI greater than 27 if they also suffer from one or more weight-related conditions. Let’s break that down. Exogenous obesity is the condition of storing extra fat because of an energy imbalance. This type of obesity arises when someone consumes more calories than they burn. Exogenous obesity is different than endogenous obesity, which occurs as a result of hormonal or metabolic imbalances (such as hypothyroidism). Since prescription appetite suppressants’ effect is to help you eat less & move more, their intended use is in people with exogenous obesity. If you are carrying extra pounds for another reason, talk to your doctor about how to address the underlying condition. The second prescribing condition for prescription appetite suppressants is Body Mass Index, or BMI. This measurement compares weight and height as an estimate of weight status. A “normal” (healthy) BMI is between 18 and 25.9. In the medical community, a person with a BMI of 26-29.9 is considered overweight. Likewise, someone with a BMI greater than 30 is classified as obese. Prescription appetite suppressants are intended for patients with a BMI over 30. These medications may also be appropriate for some people with a BMI between 27 and 30 if that person suffers from weight-related conditions, such as controlled hypertension or type 2 diabetes. Your doctor is the best person to determine the appropriateness of a prescription in your specific case. That’s because, even if you fit both of the above criteria, prescription appetite suppressants may not be right for you. These medications carry serious health risks, and should only be used under a doctor’s supervision. If you’re interested in prescription appetite suppressants, the first step is to speak with your doctor. He or she can evaluate your medical history, current (and recent) medications and goals to decide whether this type of medication is right for you! Phentermine is one of the most popular prescription appetite suppressants, but it is far from the only medication on the market. Here are some of the most popular medications that work as prescription appetite suppressants, or anorexiants. Other prescription weight loss drugs work to curb cravings, decrease fat absorption or prolong fullness. The name phentermine is short for this medication’s main ingredient, phentermine HCl. Phentermine HCl has a chemical structure similar to amphetamines, but is not an amphetamine itself. It is legal to take phentermine under a doctor’s prescription and supervision. However, given its amphetamine-like chemical structure, phentermine acts as a powerful stimulant and can prove addictive. For this reason, it is classified as a class IV controlled substance in the US and abroad. Phentermine is commonly sold in the US under the brand name Adipex-P, often referred to simply as “Adipex”. Other popular brands of phentermine include: Lomaira, Suprenza, Duromine and Ionamin. Qsymia is an increasingly popular prescription appetite suppressant that combines phentermine with an anti-convulsant medication called topiramate. While phentermine suppresses appetite and boosts energy, topiramate promotes satiety and makes food taste less appealing. The powerful combination helps you eat less and lose weight faster. Another common prescription appetite suppressant is benzphetamine HCl, or benzphetamine. This anorexiant is commonly sold under the brand names Didrex or Regimex. Similar to phentermine, benzphetamine works activates your central nervous system to curb appetite and increase energy. It is a class III controlled substance. The main difference between phentermine and benzphetamine is potency. Phentermine is the stronger medication, so it was traditionally taken just once a day (such as with Adipex – a 37.5mg dose). Benzphetamine, on the other hand, can be taken up to three times per day, depending on individual needs. The need for a less potent anorexiant has diminished as different companies have started producing phentermine in smaller doses as well (such as 8mg Lomaira). Another popular sympathomimetic amine is diethylpropion, which contains diethylpropion HCl as the active ingredient. This CNS stimulant is sold as instant release tablets and only available for patients with a BMI over 30. Common brands include Tenuate and Tepanil. Like the other medications on this list, diethylpropion works to suppress appetite and enhance energy. It is a schedule IV controlled substance. Diethylpropion achieve similar effects, but some people react better to one prescription appetite suppressant versus another due to the different active ingredients. Like benzphetamine, diethylpropion is weaker than phentermine. However, depending on the severity of side effects and personal preference, you or your doctor may prefer one medication over the others. The final sympathomimetic ammine on this list is phendimetrazine. The main ingredient is phendimetrazine tartrate and this medication is sold under the brand names of Bontril, Adipost and Melfiat. It is available as both immediate- and slow-release pills. Similar to the above medications, this drug is a CNS stimulant that triggers a biological stress response. It is classified as a class III controlled substance. Phendimetrazine and phentermine function extremely similarly. Again, the main difference arises from individual tolerance/response to the active ingredients. Some users in the phentermine support group on Facebook have commented that their doctor switches them between the two medications to avoid building tolerance. Like always, if you’re interested in a prescription appetite suppressant, speak with your doctor so that the two of you can decide which medication is best for you. In addition to prescription appetite suppressants, you may also consider other prescription weight loss drugs. Belviq, Contrave, Saxenda, Xenical and Qsymia are popular options in the US. Instead of working as CNS stimulants, these medications affect your brain or body in different ways to decrease intake and/or absorption of calories. By taking in fewer calories, it’s more possible to lose more weight. To read more about prescription weight loss drugs, visit our blog post about prescription weight loss drugs that aren’t phentermine. Can’t get prescription appetite suppressants? Consider an over-the-counter supplement to help curb your appetite and boost energy! Phentermine.com officially recommends Phen Caps as a non-prescription appetite suppressant. 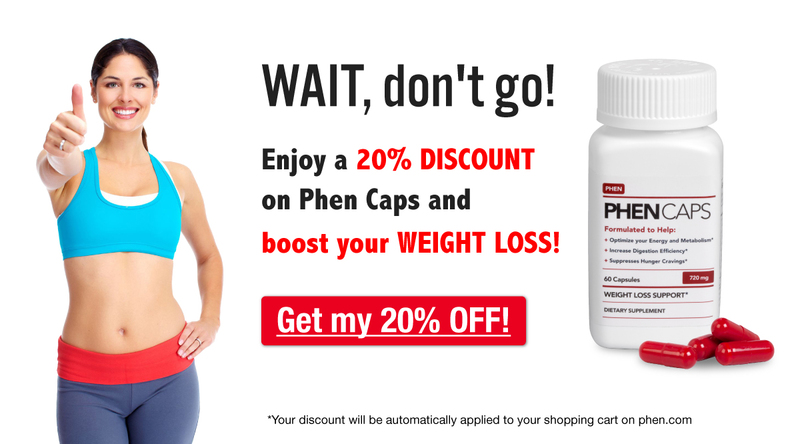 Phen Caps is dietary supplement designed to lessen appetite and increase energy through the use of nine all-natural ingredients. It does not contain any controlled substances and is available online without a prescription. To learn more about Phen Caps, or order your first bottle today, visit phen.com. Have you taken a prescription appetite suppressant? Share your experience with us in the comments section below! Prescription appetite suppressants should only be used if recommended by a doctor and if you\’re \”clinically\” overweight. This is something you have to be careful about. Hi Virginia! Yes, we completely agree. Prescription appetite suppressants are not right for everyone, and a doctor is only the person who can determine if they’re the best option for you. Thanks for your comment!